Okay, it's time for another general update. Once again, radio silence has been a result of general productivity, so I happily have a lot of ground to cover here! June started with Arts in the Alley, a non-profit I've been involved with for a while, which runs marathon volunteer mural-painting events. 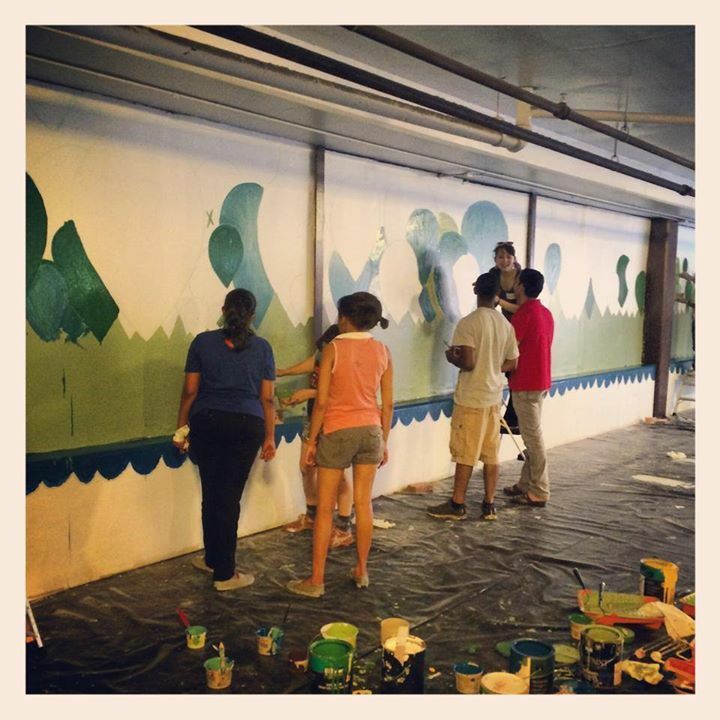 We worked for two days at Hospital Hospitality House in downtown Richmond, in which time we painted SEVEN MURALS. Woohoo! I think I'm going to make a guest appearance on their blog at some point talking about my work with them. In the meantime, here's a couple of shots of my wall taken by the superfine Firefly Imageworks, and you can see more photos from the event at their facebook page. On the HerrSuite front, I have just passed off two projects to their new owners - one mural and one sign. The mural is in the future nursery of a couple living in the fan. My only direction was for it to be gender-neutral and whimsical with a soft color palette. They've agreed to let me come back and take pictures of the room once they've got it all done up with a crib, etc. So I'll be holding off on a full project debriefing about it until then. In the meantime here's a few pictures I took pre-furniture. My other finished project, the sign, is for Jennifer of Red Lintu, a pop-up jewelry shop on etsy and at a craft fair near you (if you live in Richmond.) 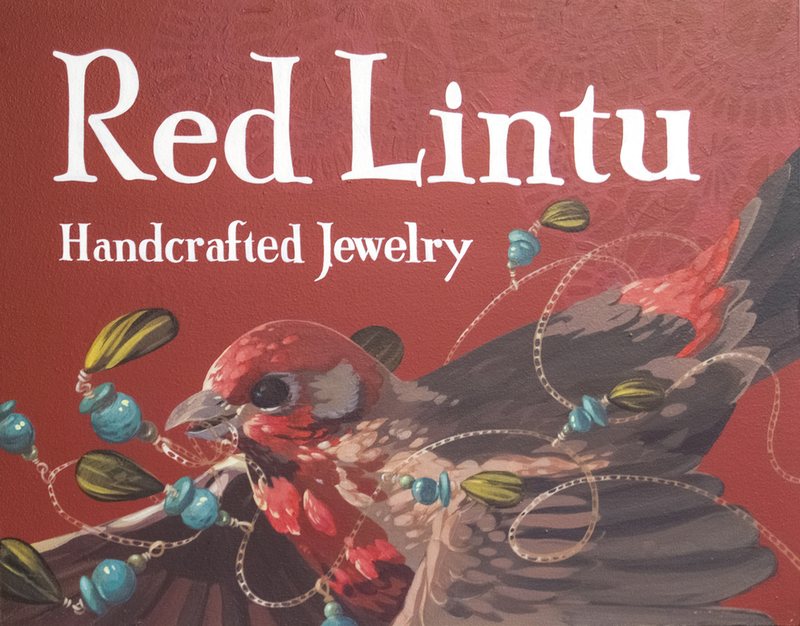 "Lintu" means bird in Finnish - the name of the business is in memory of the Jennifer's grandmother. The necklace pictured is based on an actual piece from the shop. Jennifer chose a male house finch to represent her 'red lintu'. This is especially appropriate because, like Jennifer, house finches are indigenous to the west and brought east. To the right is one of the lovely reference pictures I used to learn about what these guys look like in flight. I've also finished a sketchbook, which is pretty exciting because that takes me forever. Many of my friends and classmates zip through these things, but I'm more of a plodder. I've recently decided to double down on my efforts to work on drawing and painting outside of my full-fledged projects (something I decide anew every few months - like a diet or exercise routine). You can see the scan-worthy pages of it on my sketchblog, sketcherr.tumblr.com. The posts are one page each and sorted by sketchbook via links on the left of the site. This most recent sketchbook is called flatleaf. I'll put the cream of the crop (just the one or two best pages) in the "Other Work" section of my site, which if you haven't checked out, you totally should. It's where cool stuff like the Red Lintu sign ends up - anything that isn't a mural. I've been making a habit of setting up coffee dates with people I call my 'business crushes' - other Richmond entrepreneurs with a creative bent - to learn about their experiences running a business, working with clients, collaborating, and so on. I've met some really awesome people this way, and totally recommend it for any of my peers. It's amazing what can happen if you just ask :) It's even led to at least one cool future job....! Now that it's way less freezing and way more sweltering, I've also been working in the studio a lot more (fans are cheaper than space heaters.) I got a giant table up there thanks to Sue Henshaw, ex-potter, and a couple strong friends. I'm trying to make a habit of posting on facebook when I plan to be there for a while - I love having company while I work and there's so much space - any of you folks are welcome to drop by and say hi or beat me at darts or do some pull-ups or even draw a bit. Also, I'm only a few weeks out from a big trip - first to White Lake, NY for the Cobalt Studios Summer Scene Painting class, then to ICELAND with my family. I'll be gone for 4 weeks, and am actually running into a little trouble trying fit all the work I can in before I leave - a good problem to have, I think. I am actually booked several weeks out! I think! Sort of! Oh my god!